Andy Pye discovers how additive manufacturing helped Swansea University with its Formula Student racing car design. For the 2015 Formula Society of Automotive Engineers (FSAE) race, Swansea University worked closely with Renishaw to redesign the intercooler of its racing car and manufacture it on a Renishaw AM250 additive manufacturing system. Formula Student is Europe’s most established educational motorsport competition. The aim is to design and build a single-seater car which races on a course normally reserved for Formula 1. The history of FSAE goes back to 1981, when it was first set up in the United States. Over the years, the competition has become more and more popular with the academic and engineering communities around the world. 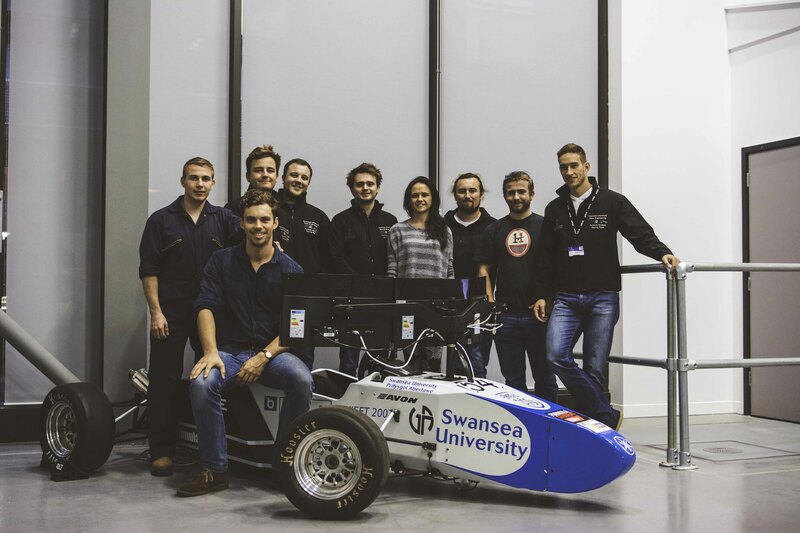 Swansea University Race Engineering has been at the forefront of the competition since 2001, experimenting with new designs and technologies. The team is made up of engineering students from across different disciplines, who work alongside experts from the Materials Advanced Characterisation Centre (MACH1) and the ASTUTE project based at Swansea University. The team focuses on developing different aspects of the car, including suspension, engine, chassis and heat transfer. One of the components that was given a radical make-over this year was the car’s intercooler. The aim was to redesign the component to make it lighter and more compact than its old counterpart. A combination of these factors was expected to improve the car’s speed. To achieve the objective, the team looked towards additive manufacturing, more specifically, metal powder bed fusion. Metal powder bed fusion uses a powerful high precision laser to fuse fine metallic powders in order to form highly complex functional components. The design of the parts is optimised using 3D computer-aided design (CAD) and the components themselves can be built from a wide range of metal powders melted in a tightly controlled inert atmosphere, in layers with a thickness ranging from 20 to 100μm. Turbochargers and intercoolers are used in the automotive industry to increase the density of the air flowing into an internal combustion engine. This allows for a larger quantity of fuel to be combusted per stroke, while still maintaining the same air-to-fuel ratio. In turn, this increase in the quantity of combusted fuel produces a higher pressure in the cylinder head, allowing the engine to provide more power. Essentially, turbochargers and intercoolers allow cars to accelerate faster and achieve higher speeds than they would otherwise. A turbocharger is made up of a turbine linked to a compressor, with the turbine connected to the exhaust pipe of the engine. The hot exhaust gas flows over the turbine making it spin. This increases the pressure of air into the engine – also known as boost pressure. An undesirable result of compressing the air is an increase in temperature of the air entering the engine. The hot air occupies a greater volume. This is where the intercooler comes in; placed between the outlet from the turbocharger’s compressor and the engine intake plenum, it removes heat from the air flowing into the engine and transfers it to the surrounding atmosphere. This further increases the density of air flowing into the engine, developing more power. Clearly, the location of the intercooler is essential because the part requires flowing ambient air to cool the boost air into the engine. Commonly, intercoolers are located behind the front grill of a vehicle, but due to their weight, it’s not always the best option for racing cars. In fact, in the Swansea University formula student car, location was one of the challenges. The intercooler is situated behind the driver, above the engine – not an optimum position in terms of heat transfer. The new high performing heat exchanger needed to have excellent heat transfer and low pressure drop through the system. The wider range of geometries made available by additive manufacturing meant the team could experiment with more innovative designs that allowed better airflow. Interestingly, although additive manufacturing has previously been used in Formula 1, the current project is unique due to the large scale and cross flow nature of a car intercooler. The main hurdles of the project came from design, material and software challenges. The team’s objectives were to ensure a high density of boost air for the engine, while still maintaining a good mass flow rate of air. This intercooler also needed to be as light as possible, to improve acceleration. To identify the best alternative, students tested four intercooler core designs. The different iterations reflected the design principles and capabilities of different manufacturing methods. The first core design, used as a benchmark, was a conventionally manufactured aluminium alloy, AlSi10Mg core with a simple vertical design on the ambient side and a sine wave shape on the boost side. The second core was designed from 316L stainless steel using metal powder bed fusion. The design was identical to the first one, but was used to test how the added surface roughness available with additive manufacturing impacted heat transfer and pressure drop. The real benefit of additive manufacturing came when the students started experimenting with the design freedom of the technology. The third intercooler core had a lattice of three dimensional star shapes to form the mesh – a design only made possible by additive manufacturing machines. The mesh was generated using additive manufacturing software and although it took several iterations, the team knew that they were on to a winner. The fourth and final core used the same three dimensional star lattice structure used in the mesh core, but also made the strut cross-section finer, which meant a higher surface area and density. Although superior to casting, the surface finish was not as smooth as a manufactured surface. The tests found that the higher surface roughness of additively manufactured intercoolers outperformed conventional counterparts. This counter intuitive result could be due to better air mixing, altered flow conditions or a combination of both. A good example is shark skin which is rough but very efficient. Recently, biomimicry, the study and emulation of nature in engineering has become topical. Additive manufacturing could play a role in creating and researching novel shapes. After the students identified the most efficient design, the question of what material they should use came into the spotlight. They originally tried titanium Ti6Al4V, a lighter alternative to stainless steel, but with lower thermal conductivity. At this stage, Renishaw stepped in and offered to manufacture the part using aluminium alloy AISi10Mg, a material considered ideal due to its high thermal conductivity and light weight. Renishaw used the students’ designs to manufacture the intercooler. Handling the designs was actually one of the most complex aspects of the project, mostly due to their large size. However, it was the computer-aided design (CAD) functions that allowed the most efficient positioning of the lattices to allow maximum heat efficiency, thus increasing the capabilities of the intercooler.